Workplace bullying and harassment situations often masquerade as conflict. But they aren’t. Applying a conflict resolution model to a bullying or harassment situation makes the problem worse. 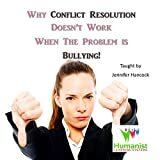 Why Conflict Management Doesn't Work When the Problem is Bullying!